Image: ISRO Chairman Dr K Radhakrishnan with then French president Nicolas Sarkozy and his wife Carla Bruni during their visit to ISRO's satellite centre in Bengaluru. Only two years earlier the Indian Committee for Space Research (under the DAE) had established the Thumba Equatorial Rocket Launching Station in Kerala. The spot, being close to the magnetic equator of the earth, was (and is) an ideal location for scientists to conduct atmospheric research. I remember once attending an interaction between the Dalai Lama and then President A P J Abdul Kalam in Delhi; the theme was science and spirituality. Kalam told the Tibetan leader about his first visit to Thumba. As a young scientist, Kalam accompanied his 'guru', Dr Vikram Sarabhai, father of the Indian space programme. The ideal location for the rocket launching station was a plot of land belonging to the local Catholic mission on which a small church was located. Kalam recounted that that day he realised the closeness between science and spirituality as he heard Dr Sarabhai arguing with the local priest that science was also searching for God, and by offering his church as the first lab for the TERLS, the priest would only be serving God. Dr Sarabhai was so convincing that the priest eventually accepted that argument and TERLS was established. The St Mary Magadelene church even served as the office for Dr Sarabhai and his team for a few years. ISRO was officially formed in 1969 and three years later, it was brought under the newly-established Department of Space. Since then, the posts of secretary, DOS and chairman, ISRO has been occupied by the same person. Professor Satish Dhawan was the first occupant of the both seats; today, the Sriharikota launch site in Andhra Pradesh bears his name. The 'trusted' collaboration between France and India, as the ISRO scientists put it, has never been much bothered by administrative changes and has continued uninterrupted till today. In 1972, a US sounding rocket (Nike-Apache) and a Centaure from France were launched from Thumba, with Indian scientific payloads. The Symphonie satellites, built by France and Germany in the 1960s became the first complete telecommunications satellite system. For two years, from June 1977, Symphonie-A was repositioned over the Indian Ocean at 49° east, where it carried experiments with ISRO, providing system test of geosynchronous satellites for India's domestic telecommunications. 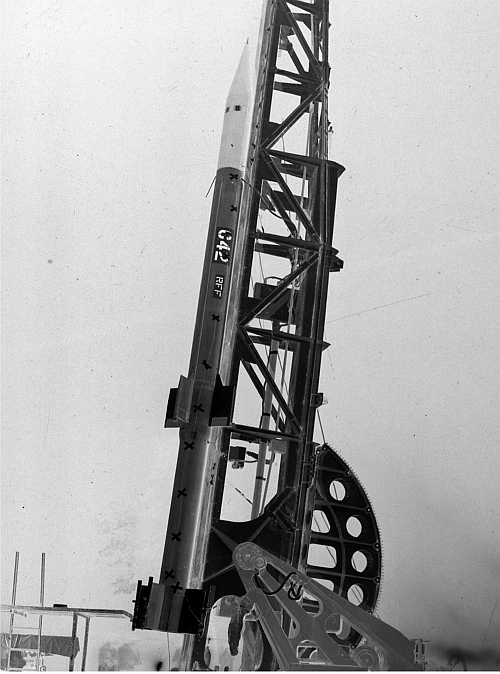 Image: In 1972, an American sounding rocket (Nike-Apache) and a Centaure from France were launched from Thumba, with Indian scientific payloads. It helped India to build its own indigenous competence in communications satellites. On his way back from a Commonwealth Conference in London, Morarji Desai, then the Indian prime minister stopped at Paris in June 1977. He was keen to review the bilateral relations between India and France with President Giscard d'Estaing. On this occasion, another Indo-French agreement was signed between the two countries; it reaffirmed the mutual desire of Paris and Delhi to strengthen and increase the existing co-operation in the field of exploration and utilisation of outer space for peaceful purposes. It was a major step forward. Fifteen years later, the cooperation deepened when a new accord between ISRO and CNES was inked: the two organisations agreed to study cooperative satellite programmes for space research. Both sides acknowledged the importance of atmospheric energy exchanges and water cycles in the climate dynamics of the tropical belt. In December 1997, a common project for setting up a joint earth observation mission dedicated to study tropical atmosphere from space was announced: the Megha-Tropiques project was born (megha for clouds in Sanskrit; tropiques stands for tropics in French). President Chirac's visit in January 1998 and Prime Minister Atal Bihari Vajpayee's trip to Paris later that year gave bilateral relations a tremendous boost. Space was a part of this looking into the future. When Professor Claude Allegre, the French minister for education and research, visited Bangalore in November 1999, he reiterated France's interest in jointly researching tropical weather and climate change. Megha-Tropiques was designed as a scientific satellite to observe water vapour, precipitations and radiation in the intertropical zone with an orbital inclination of 22° and altitude of 800 km. Today, it provides observation data of this zone (not covered by Western satellites) up to six times a day. The objective of the Megha-Tropiques is also to study intra-seasonal and inter-annual variations of the energy and water budget of the land-ocean-atmosphere system. 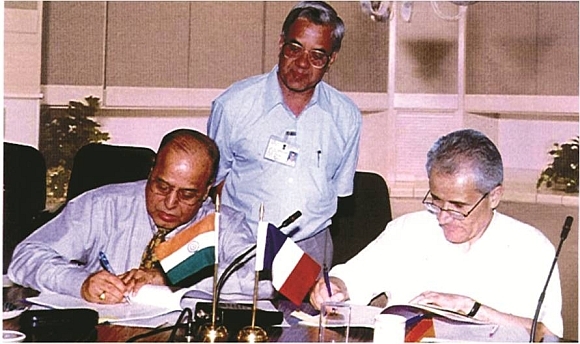 Image: Then ISRO chairman Dr K Kasturirangan and Professor Bensoussan of CNES sign the Megha-Tropiques MOU in 2001. Dr Manmohan Singh's visit to France in September 2008 gave a further impetus to the already close cooperation. 1. A framework agreement on cooperation in the peaceful uses of outer space. It includes joint research and development activities, instrumentation for satellites, development of small satellites, study of weather and climate change using earth observation satellites and the development of ground infrastructure for satellite programmes. 2. A MoU between Indian Institute of Space Science and Technology of DOS and Ecole Polytechnique of France for enhancing academic exchanges and research activities. 3. An agreement between Antrix, a commercial arm of the Department of Space, and Astrium, a subsidiary of the EADS, which provides civil and military space systems. The objective is to offer attractive solutions for in-orbit delivery of its earth observation satellites using the PSLV launch services from Antrix/ISRO. Space is undoubtedly the field which has seen the largest number of bilateral agreements between France and India since the 1960s. The French always appreciated the collaboration with ISRO. Dr Alain Bensoussan, a former CNES chairman, told us, "I discovered the Indian space effort with great admiration. I was very impressed by Dr K Kasturirangan, former chairman of ISRO, with whom I worked. Ten years after I left the CNES, I still entertain friendly contacts with him." "His expertise and his vision brought an undisputed leadership to the organisation," Dr Bensoussan added. "ISRO's achievements, including satellite imagery, were amazing. A very assertive strategy allowed the Indian space programme to go quickly through the developmental stages of its space programme." The French were not only astounded by the speed of the Indian programme, but also by the fact that Indian scientists remained down-to-earth and concentrated on practical applications; as Dr Bensoussan put it: "More than any other space powers, India also worked on tele-medicine and tele-education." Adding a personal note, he said: "I found ISRO engineers very motivated by industrial applications and their benefits; much less by inhabited flights which they only considered a matter of prestige, with a distant industrial impact. That is why I told them, and that was ironic, that they reminded me of the British (by their pragmatism)." Image: Then ISRO chairman G Madhavan Nair, left, signs an agreement with his French counterpart. 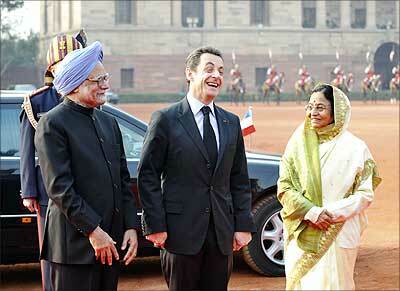 Dr Singh and then French president Nicolas Sarkozy can also be seen. 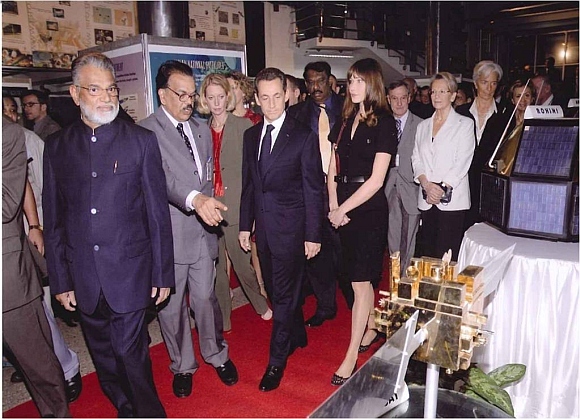 It is in this context that President Sarkozy and his wife Carla Bruni visited ISRO in Bangalore on December 4, 2010; during his visit, Sarkozy inquired about the progress of the jointly developed Megha-Tropiques satellite. At that time, it was reported that 50 per cent of the work was completed. Sarkozy was also briefed on the forthcoming project, the SARAL satellite. The Indian media pointed out that France was the only permanent member of the United Nations Security Council with whom India was jointly developing satellites for civil purposes. Two days later in Delhi, an MoU for cooperation in earth system science and climate was signed between the ISRO chairman and his French counterpart. The Indo-French space saga continued. 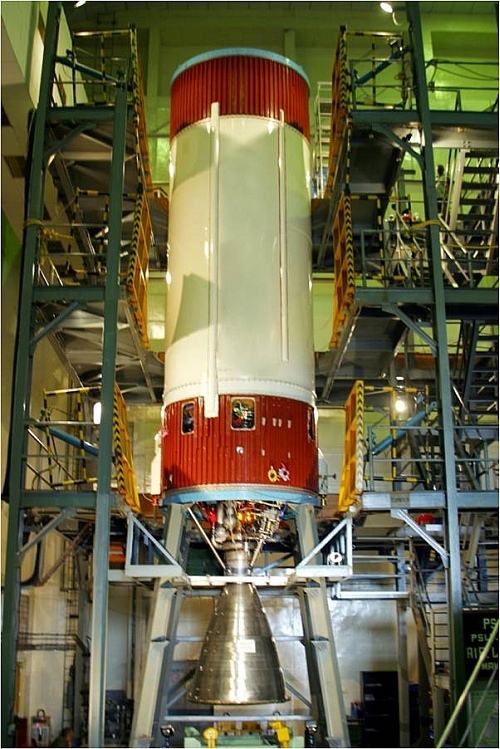 On October 12, 2011 in Sriharikota, the Polar Satellite Launch Vehicle (PSLV-C18) put the Megha-Tropiques satellite into orbit along with three micro-satellites: The SRMSAT built by the SRM University, Chennai; the remote sensing satellite Jugnu from the Indian Institute of Technology-Kanpur; and the VesselSat-1 of Luxembourg to locate ships on the high seas. The division of labour was clear: The reception of data had to be conducted by ISRO in Bangalore and the CNES (Kourou and Hartebeesthoek, South Africa); the control of the spacecraft and of the operations was ISRO's responsibility. You may say, all this is very complicated for the 'common man,' but ultimately it is the aam aadmi which will directly benefit from the data procured by the satellite, as it will help to better monitor climate changes, understand the dynamics of the monsoon, and ultimately make weather forecasting more accurate. Today scientists from 21 countries -- Australia, Brazil, Italy, Japan, Korea, the United Kingdom, the United States, among others -- benefit from the data generated by Megha-Tropiques. Image: French President Nicolas Sarkozy with then President Pratibha Patil and Prime Minister Manmohan Singh at Rashtrapati Bhavan. In August 2010, the Department of Space announced the plans to launch the SARAL satellite, a cooperative mission between ISRO and CNES to monitor the sea water level. The SARAL satellite will carry two payloads: An altimeter (ALTIKA) for studying the sea surface heights and ARGOS (Advanced Research and Global Observation Satellite), a global satellite system based on a data collection platform for gathering variety of data from ocean buoys to animal behaviour. The mission is dedicated to science applications like meteorological observations and environment study and protection. The ALTIKA and ARGOS payloads are built and supplied by the French, while ISRO is building the satellite with the payloads modules. The launch, also ISRO's responsibility, will be via a PSLV rocket which will put SARAL into sun-synchronous orbit. ISRO will also have the responsibility for the spacecraft's operations. The SARAL mission is complementary to joint missions of NASA and the National Oceanic and Atmospheric Administration and also the one developed by the CNES and the European Organisation for the exploitation of meteorological satellites. ISRO officials believe it will fill the gap between Envisat and the Sentinel 3 mission of the European programme whose main objectives are to measure sea-surface topography, sea-and land-surface temperature and ocean-and land-surface colour with high-end accuracy for environmental and climate monitoring. On a commercial basis, the partnership has also been close: One just needs to mention the procurement of satellite components and subsystems from French industry for ISRO programmes and Arianespace which has provided launch facilities for as many as 14 communication INSAT satellites. In 1981, the Ariane LO3 rocket launched the Indian Apple satellite. More recently, the French SPOT-6 satellite was launched by PSLV C-21 on September 12, 2012. After world leaders gathered for the Doha Climate Change Conference to try to find an agreement to replace the Kyoto Protocol, it was clear that one of the issues which has hampered a progress was the lack of proper scientific data on climate change. The soon-to-be 50-year-old India-France 'trusted' collaboration in space -- particularly, the launch of the Saral satellite -- though not as glamorous as some other joint projects between the two countries, could provide in the long run the necessary inputs for the most crucial issue of the century -- the Climate. Coming soon: ISRO's mission to Mars!